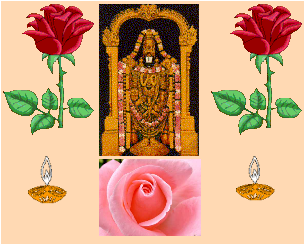 Sri N. Krishnamachari for the Sri Vaishnava Home Page. The word marIci means a ray of light. SrI Bhattar interprets this name as indicating that bhagavAn reveals Himself to His devotees through the eye of their devotion even though they can't see Him through their natural eye. The author in dharma cakram indicates that this guNa of bhagavAn should remind us that we should aim for the ray of light that will help us meditate on Him. This we can achieve by first controlling our indirya-s, which then converts the body's energies into mental energy. Then by control of the mind, this energy is converted into the light that gives the clarity of mind that can help us meditate on Him. A different interpretation is given by SrI satyadevo vAsishTha for this nAma. The word marIci is derived from mR prANatyAge to die, to perish. He interprets marIci as one who destroys. Since it is one of bhagavAn's functions to destroy the beings that He creates, He is marIci. To support this, he gives the examples from bhagavad-gItA - jAtasya hi dhruvo mRtyur-dhruvam janma mRtasya ca (2.25); mRtyuh prajAnAm adhipatih (atharva 5.24.13), etc. b) Subduer - One who controls and punishes those who swerve from their prescribed path. c) He Who controls everything by pervading everything. The word is derived from the dhAtu - dam upaSame = to tame. damayati iti damanah - One who dispels. SrI kRshNa datta bhAradvAj and SrI baladeva vidyA bhUshaN give similar interpretations. SrI baladeva vidyA bhUshaN explains the nAma as “damayati vicheda tApam sva-dhyAtRRNAm kAnti kantalIbhih iti damanah” – He Who dispels the sufferings of those who meditate on Him through His kAnti. SrI kRshNa datta bhAradvAj gives the interpretation: dAmyati upaSamayati kAnti kiraNaih upAsInAnAm manas-tApam iti damanah – He Who removes the sorrow in the minds of His devotees through His when they meditate on Him. b) SrI Sankara interprets the nAma as “The Subduer” - One Who controls and punishes those that swerve from their assigned duties (damayitum Seelam yasya sa damanah). This could be in the form of a king while the people are in their mortal bodies, as yama after they die, etc. SrI cinmayAnanda explains that the damana aspect of bhagavAn is responsible for controlling the rAkshasic impulses within every one of us. In the form of pain and agitation, sorrow and death, it is He who controls all the negative tendencies in everyone's heart. He also has controlled the vicious against the good in the form of His ten incarnations. c) SrI vAsishTha interprets the nAma as “One Who controls everything in this world by pervading everything and keeping things in order” – damayati – upaSamayati yathA sthAnam prApayati, damana dharmeNa viSvam sa-carAcaram vyApnoti, iti damanah. i) damanAsura samhAratvAt damanah – He Who destroyed the asura by name damana. ii) damana priyatvAt da-manah – He Who likes taming or subduing the wicked. iii) damo yeshAm asti iti damAh, tAn nayati iti dama-nah – He Who is the Supreme among those who have control of the mind and the indriya-s (dama-nah). iv) dam abhIshTa dAtR mano yasya sa iti vA da-manah – He Who has the mind to bestow whatever is desired on His devotees (da-manah). The author in dharma cakram points out that when one does not lead a life based on strict sAttvic principles, including the food habits, etc., one gets diseases and other mental pains. These are all acts of bhagavAn to discipline the person with the intent of helping the person learn and realize the right path. This is His act of damana, or controlling, punishing, guiding, etc. The reader is also referred to nAma 864 (Slokam 92) - damayitA, which is dervied from the root as the current nAma, damanah. 21.193 - hamsah One who is like the swan. Hamsa is capable of separating milk from water and drinking only the milk and leaving the water behind. Hamsa is also noted for its beauty, especially for its walk. BhagavAn is hamsa in that He is everything that is good and nothing that is not good. He is also hamsa for His beauty in thought, word, and deed. We had made extensive reference to the hamsa incarnation of bhagavAn in the explanation for the nAma surAnanda. Thus the current nAma can also be viewed as a reference to the hamsa avatAra of bhagavAn. Another interpretation, given by SrI Sankara, is that hamsah indicates that bhagavAn kills (han) the fear of samsAra in those who realize that aham sah - I am He. This (I am He) is traditionally quoted in discussions supporting the advaita philosophy. In some of his upanyAsa-s, SrI kRshNa Premi describes the following upa-katha involving a disciple who went alternately to an advaita and a visishTAdvaita teacher, who taught him alternately their philosophy - so'ham, dAso'ham, sadA so'ham, and dAsadAso'ham. Notice the play of words here, adding dA to the first one, sa to the next one, and dA again to the third word to get the fourth. Yet another interpretation is hanti gacchati sarva SarIreshu iti vA hamsah - He moves in all beings and bodies and so He is called hamsa. a) (literally) One possessed of charming feathers – see below. b) One who can lead men to the other shore across the ocean of samsAra. a) In SrImad-bhAgavatam we have - siddheSvarANAm kapilah suparNo'ham patatriNAm - Among the siddha-s, I am Kapila, and among birds I am GaruDa (11.16.15). In Bhagavad-gItA, we have mRgANAm ca mRgendro'ham vainateyaSca pakshiNAM - Among beasts, I am the lion, their king, and among birds, I am GaruDa, the son of VinatA (10.29). Thus, suparNa is interpreted as referring to His being the Best of the best in all that exist. b) parNa means wings. Sobhana parNatvAt suparNah - suparNa means One with auspicious and beautiful wings. He is suparNa because He carries His devotees to the other shore of the ocean of samsAra. c) In the upanishad-s, we have reference to two beautiful birds sitting on the same tree - signifying the jIvAtmA and the ParamAtmA dwelling in the same body. One (jIvAtmA) eats the fruits of actions, and the other (ParamAtMA) just gazes on (sAkshI). VishNu is this all-experiencing Principle of Consciouness. one eats the fruits, the other eats not and gazes on". SrI rAdhAkRshNa Sastri refers to one as the great enjoyer (pErinbam), and the other as the Great Knower (pEraRivu). d) The nAma can also relate back to the previous nAma – The hamsa incarnation with beautiful wings. 21.195 - bhujagottamah The Master of the Serpent AdiSesha. bhujaga refers to the species which navigate using their shoulders or arms - bhujena gacchanti, rather than through their legs. Here bhujaga refers to AdiSesha. uttama can refer to 'one who is above'. Here it refers to bhagavAn who is reclining on top of the AdiSesha. He is the SeshI or the Lord of the Sesha. He is reclining on ananta the Serpent as the couch. Or the name could also refer to bhujagAnAm uttamah - One who is the best among the serpents. i.e., it can refer to ananta - see bhagavad-gItA 10-29 - anantaScAsmi nAgAnAm. Even though I am finding the interpretations of SrI satyadevo vAsishTha to be on the side of being unconventional, I am including them since he supports his interpretations with extensive support from grammar, quotes from sruti-s etc. Here he starts with the dhAtu bhuj kautilye to bend, to curve. He points out that bhagavAn is bhujagottama because He is the best of all that bend and move. This includes air, birds, etc. Wherever anything of this category can reach, no matter how fast they fly or move, bhagavAn is there before them. Even the man-made machines that fly cannot go anywhere including other planets faster than Him, since He is there before them. Not only that, even the ability for those that fly etc. are given only by the Grace of the Lord. 21.196 - hiraNya-nAbhah One who supports in His navel the creator, hiraNyagarbha. Literally the word means "One who has a beautiful navel with a golden hue". Here it refers to the navel that is great by having created the catur-mukha-brahmA who is also well-versed in the catur-veda-s. brahmA gets his greatness because he creates all the beings thus giving them the opportunity to reveal their greatness. This great brahmA was borne out of the navel of vishNu, and thus the greatness of the navel that bore the great brahmA is evident. Just as a nation that creates great people becomes known as a great nation, so is the analogy here, to quote the dharma cakram writer. a) One who is possessed of supreme knowledge. b) One with consistent creative thinking. SrI Bhattar interprets tapas as knowledge, and gives the first interpretation above. SrI Sankara uses the following from mahAbhArata - mansaScendriyANAm ca hyaikAgRyam paramam tapah - The concentration of mind and senses is called supreme tapas - (MB 12.242.4). SrI chinmayAnanda gives the following support from the upanishad - sa tapah taptvA idametadasRjat (He thought, and through thought He created all this). The author in dharma cakram points out that the strength derived from tapas is more powerful than any other strength, and gives the example of how viSvAmitra's army was powerless against vasishTha's tapo-Sakti. It was through tapas that viSvAmitra ultimately attained brahma-j~nAna, and it was through tapas that dhruva attained the immortal position. Lord vishNu is tapas-Incarnate (sutapAh), and thus guides His devotees in the path of tapas. SrI satyadevo vAsishTha interprets tap to mean the ability to bear (kleS kA sahnA in Hindi). The example of a mother bearing the strain of an unborn child for 9 months just so she can bring out the child to this world is but a reflection of bhagavAn's su-tapa or His bearing the tejas of the likes of Sun so that it can bring out the good for the beings of this world, without burning them with its heat etc. So bhagavAn is the mahA-tapasvI. This nAma had occurred earlier as nAma 48. There the interpretation was that the lotus (the cause of the Universe) emanates from His navel. Another explanation given by SrI Sankara for the current nAma is that bhagavAn is in the centre of everyone's hRdaya kamalam or heart (nAbhI means also the central part, and padmam in this context is heart). The author in dharma cakram enjoys this nAma in various other ways. When lotus (padmam) blossoms, it attracts the bees and other insects towards it; so also, bhagavAn (padma-nAbhI) attracts all the jeevans to Him. Lotus is the most beautiful and fragrant of flowers; so also our padma-nAbha is the embodiment of beauty. Lord rAmA's beauty has been described by Sri Kamban - tAL kandAr tALE kandAr. Unlike the bodily beauty which brings down people to a lower level, the beauty of padma-nAbha can only elevate people to a higher level. SrI satyadevo vAsishTha gives additional insight into this nAma from yet another perspective. Padmam also means knowledge - padyate j~nAyate anena padmam j~nAnam. One who is the Center or reservoir of Knowledge, or One who controls and rules over Knowledge is padmanAbha (the author uses the term j~nAna-bandhanah as the equivalent of padma-nAbha based on this explanation). 21.199 - prajApatih The Lord of beings. tat padmodbhava-prabhRtInAm prajAnAm patih - The Lord of all beings including brahma born of that lotus. This pertains to the creation and destruction that take place periodically. Pati also means father, and since all creatures have emerged from Him, He is prajApati. He is the Leader who appears whenever needed to establish dharma.